Can I use my INDOOR TV Outside in Dallas, TX? Home / Articles / Can I use my INDOOR TV Outdoors? Can I use my INDOOR TV Outdoors? As a Dallas home automation company, we spend almost as much time planning outdoor spaces for our client's smart homes as we do indoor spaces. Texas may have extreme heat, but we also have the ability to enjoy the outdoors almost year round. When planning and designing outdoor living spaces one of the most common questions that we get is, “can I just use an indoor TV outdoors?” The simple answer is, “Yes, but you probably don't want to.” Read on to see why I say that. There are a few factors that we must consider when we think about the successful installation of a TV outdoors. The two most obvious are cost and durability. Clients typically want to know if a cheap TV will survive long enough to be a “good investment”, and how much more reliable an outdoor TV is. But on top of those concerns there are important questions about how enjoyable the experience of using the TV will be. Indoor TVs installed outdoors tend to be dim, and are almost always installed in the most well-protected areas, not necessarily the best areas to enjoy your backyard. The most significant change in outdoor televisions in recent years is price. There is no escaping the fact that outdoor TV's were once prohibitively expensive, but that has changed significantly. 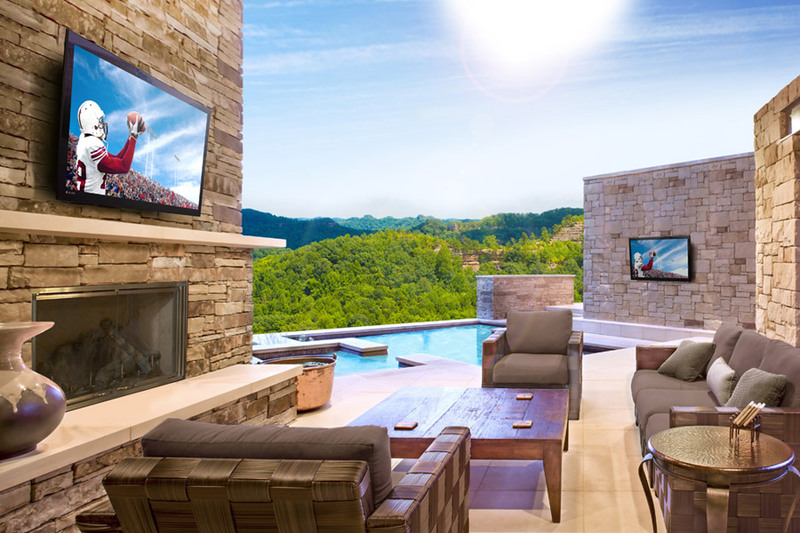 You can now purchase a 4K outdoor TV for under $2000. When you consider how many more options, and how much piece of mind, an outdoor TV provides the cost becomes incredibly reasonable. 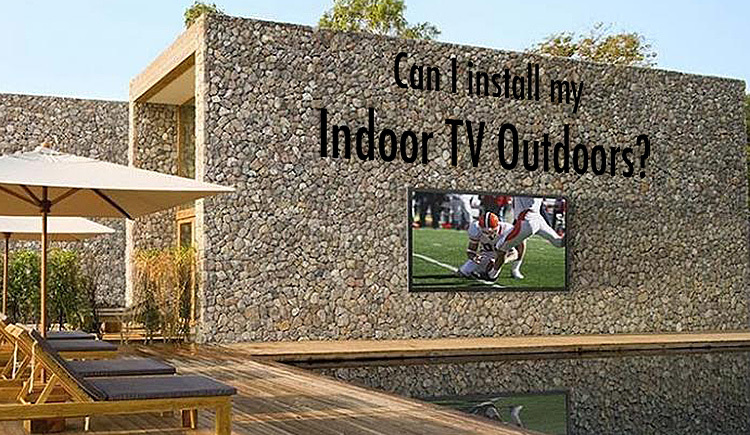 Outdoor TVs can now be purchased in sizes up to 75”, so they can be made to work in any yard. Most people assume that an indoor TV will work great outside, assuming it can survive the elements. Typically, our clients tell us that the TV will be out of the rain, and so it should be ok....right? Again, the answers is a firm maybe. Direct intrusion of water is a big deal, and certainly would destroy an indoor TV instantly. It isn't just rain that concerns us. We have seen indoor TV's destroyed by pool equipment, water gun fights, bugs, sunlight, humidity, temperature and even errant golf balls! Simply put, outdoor TVs are designed to be outdoors, with all of the potential destruction that implies. Indoor TVs placed outside should be covered when not in use, adding expense and an additional chore that needs to be done before enjoying the TV. In Texas, temperature alone can destroy a TV installed outdoors. According to Samsung their indoor TVs are only safe to store at temperatures up to 113° F, while an entry-level Sunbrite can remain outdoors in temperatures up to 140° F. That additional margin can go a long way in improving the life of electronics. One place outdoor TVs are significantly better than indoor TVs is brightness. Simply put, it is brighter outdoors that indoors when the sun is out, and indoor TVs are designed to be used in the home, protected from the brightest sunlight. There are outdoor TVs designed for partially shaded areas, and those designed for receiving direct sunlight. Indoor TVs are not designed for direct sunlight, and would simply be unusable in such a situation. Even with indirect sunlight an average, and particularly a cheap TV, isn't enjoyable to watch, similar to an iPhone with the screen too dim for the conditions. Outdoor motorized screens can be used to cut some of the natural light out of a covered outdoor living space, but even with them an outdoor TV will still produce a better image for such a bright space. The most important option that an outdoor TV provides is the ability to place your TV wherever you want within your yard. Commonly, homeowners spend tens, if not hundreds, of thousands of dollars building a pool, purchasing landscaping, and generally making their yard into a beautiful place. They then purchase an indoor TV and install it on the side of their home so they can sit with their backs turned to the beautiful yard they just paid for. Who wants to stare at the side of their house when a wonderland is just feet away? With an outdoor TV we can move the TV out into the yard, allowing our clients to spend more time enjoying their beautiful space, not simply watching TV out in the elements. 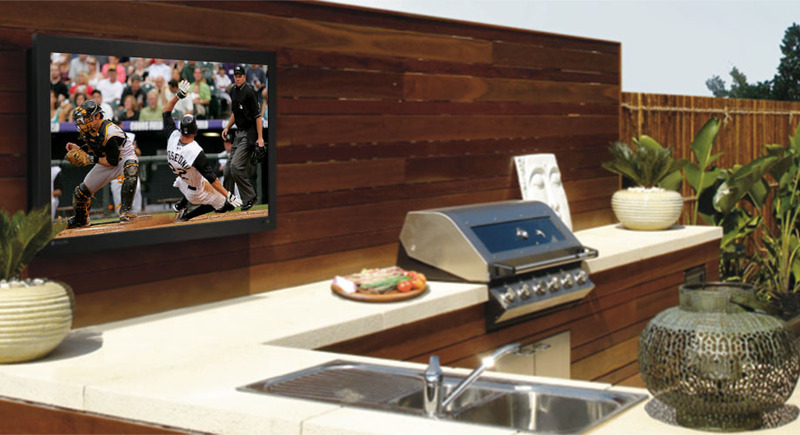 Consider mounting an outdoor display near the pool, so you can watch the big game without getting out of the water. Or maybe a TV near the BBQ for dad to enjoy while he makes burgers for the neighbors. The flexibility of a Seura or Sunbrite outdoor TV opens up so many options to allow you to truly enjoy and experience that outside space you spent so much time and money to build. If you want to enjoy your backyard more this year call Audio Video Innovations today @ 972.529.4470 or EMAIL US.